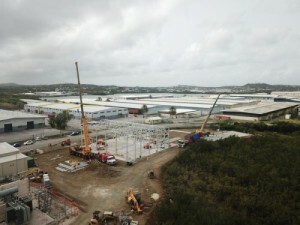 WILLEMSTAD - The construction work for the new 39 MW power plant at Aqualectra on the Dokweg is progressing steadily. According to plan, the delivery of the power station, which involves an investment of 70 million guilders, must take place in February 2019. Once operational, Aqualectra will have sufficient capacity and reserve capacity with the new power station to supply the community with power, the utility company promises in a written statement. Those driving along the Dokweg, can take note of the construction taking place. At this moment a robust floor has been installed to be able to carry the production machines of the plant. This involves not less than 800 cubic meters of concrete. This base must be particularly strong because the generators will be placed on this, which together weigh no less than 550,000 kilos. Around the floor you can already see the strong iron edge of the building where the power station is located. Meanwhile, 45,000 kilos of the total 300,000 kilos of iron that is available for construction have been used.